The intensifying demand for a class of pesticides that are safe to humans, environmental-friendly, and can treat pest insects that are immune to common insecticides has led to a rapid emergence of insect growth regulators (IGRs) in recent decades. IGRs are a kind of bio-rational compounds that can disrupt the normal development in insects, in both embryonic and post-embryonic stage, and work essentially by interfering with their molting process. World over, their soaring popularity in recent years is attributed mainly to their selectivity of action on specific pests and their non-toxicity to humans and the ecology. Unlike other pesticides, IGRs do not cause instant mortality but affect the hormonal process, and their long-term exposure on pests being treated cause their population to decline over time. The marked compatibility of IGR with other biological pest management systems is a key factor expected to bolster their uptake for controlling pests in agriculture, forests, gardens, and livestock. The global insect growth regulators market is predicted to rise from US$747.7 Mn in 2017 to reach a valuation of US$907.2 Mn by the end of 2022 end. The market is expected to register a CAGR of 3.9% from 2017 to 2022. The various product types are chitin synthesis inhibitors, juvenile hormone analogs and mimics, and anti-juvenile hormone agents. Of these, the chitin synthesis inhibitors segment holds a major share and is projected to witness leading absolute growth annually from 2017 to 2022, estimated at US$12.4 Mn. The segment’s valuation is pegged at US$414.5 Mn by 2017 end, representing a share of 55.4% in the market. The chitin synthesis inhibitors product type of insect growth regulators is projected to rise to US$ 476.3 Mn by 2022 end, which represents a share of 52.5% in the market. The segment is projected to expand at a CAGR of 2.8% from 2017 to 2022. The vastly rising use of these compounds in agriculture is driven by their rapidity of action on a large number of insect pets and their marked functionality in disrupting the normal embryonic development leading to the destruction of their eggs. IGRs affecting other species not harmful to ecology is a key factor likely to hamper their demand to an extent. The various regional markets for insect growth regulators are Latin America, North America, the Middle East and Africa, Europe, Asia Pacific excluding Japan (APEJ), and Japan. Of these, currently North America holds the dominant share of the global market and is anticipated to maintain its lead throughout the forecast period. The regional market is projected to rise from a valuation of US$261.6 Mn in 2017 to reach US$319.7 Mn in 2022. This represents a CAGR of 4.1% from 2017 to 2022. Substantial developments in advance formulations of insect growth regulators are fuelling the regional market growth. The presence of a number of prominent companies in the region is also accentuating this market. The Asia Pacific excluding Japan (APEJ) insect growth regulator market is projected to rise at an absolute opportunity of US$37.4 Mn from 2027 to 2022 and is expected to present substantial lucrative avenues for market players. Meanwhile, Europe is predicted to create an absolute opportunity of US$36.8 Mn between 2017 and 2022. Key players profiled in the report are Dow Chemical Company, Bayer Crop Science AG, ADAMA Agricultural Solutions Ltd., Syngenta AG, Nufarm Ltd., Platform Specialty Products Corporation, Sumitomo Chemical Company Ltd., Valent USA Corporation, Central Garden & Pet Co., and Russell IPM Ltd. Several players are focused on developing advanced formulations of insect growth regulators that can treat a wide range of insect pests. Prominent companies are entering into mergers and acquisitions to gain a better stronghold in the market. The report on the global insect growth regulators market provides a detailed insight into key drivers and restraints, notable trends, share and size of various segments, and competitive landscape. The study takes a closer look at regulatory landscape prominent in various regions. It offers a critical evaluation of the pricing strategy and cost structure, and assesses the various factors driving the prominent segments in various regions. The report takes a closer look at raw material sourcing strategy and analyzes supply chain dynamics. The study gleans through a wide range of data and statistics during the historical period (2012–2017) and highlights pertinent trends that may affect the growth of major segments over the forecast period (2017–2022). The findings in the study is an indispensable guide for market participants to identify lucrative avenues and opportunities in untapped markets in various regions. 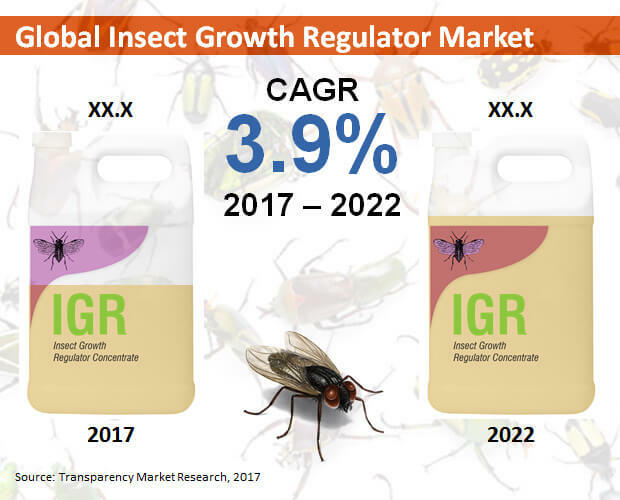 The global insect growth regulator market is estimated to be valued at US$747.7 Mn by 2017 end and is anticipated rise to be worth US$907.2 Mn by 2022 end. The market is forecast to register a CAGR of 3.9% during 2017–2022. The report provides a broad outline of the market outlook by covering key drivers and restraining factors, raw materials sourcing analysis, industry chain overview, and strategic dynamics. The study takes a closer look at recent developments pertaining to regulatory and technology and evaluates their role in influencing the trajectory of the growth of the market during the forecast period. The growing demand for eco-friendly and safe alternative control measures for a variety of insect pests in various outdoor and indoor applications in agriculture, forests, livestock, and gardens is a key factor driving the market. The intensifying need for controlling insect pests of stored foods without affecting other beneficial organisms is a crucial factor fortifying the demand for insect growth regulators. The discriminate use of pesticides has led to the emergence of insecticide-resistant pests that need biological control. The use of insect growth regulators in proper amounts, along with other biological pest management systems, helps in eliminating the populations of these pests by hindering the growth of their progeny. The commercial availability of eco-friendly insect growth regulators to treat insect pests infesting citrus, grapes, vegetables, and bananas in varied environmental conditions bodes well for the market in developing and developed regions. The report covers various segments and offers market projections on their share and size. The study offers a comparative assessment of their valuation year-over-year (YoY) across various regions and evaluates key trends impacting the growth of major segments. The report segments the global insect growth regulators market on the basis of product type, form type, application, and region. The report sub-segments the product category into chitin synthesis inhibitors, juvenile hormone analogs and mimics, and anti-juvenile hormone agents. Of these, the chitin synthesis inhibitors segment holds the dominant share in the market and is expected to maintain its dominance until the end of the forecast period. The segment is projected to be valued at US$476.3 Mn by the end of the forecast period (2017- 2022). The report further segments the form type into bait, liquid, and aerosol. Based on application, the report sub-segments the market into agriculture and gardens, livestock pest control, and commercial pest control, and others. Based on region, the report segments the global market into Latin America, North America, the Middle East and Africa, Europe, Asia Pacific excluding Japan (APEJ), Japan, and others. Of these, North America is the dominant market in 2017, vis-à-vis revenue, and is expected to remain so throughout the forecast period. Prominent players discussed in the report are Dow Chemical Company, Bayer Crop Science AG, ADAMA Agricultural Solutions Ltd., Syngenta AG, Nufarm Ltd., Platform Specialty Products Corporation, Sumitomo Chemical Company Ltd., Valent USA Corporation, Central Garden & Pet Co., and Russell IPM Ltd. The study offers an elaborate profiling of these players and highlights key strategies adopted by them to consolidate their shares in various regions.